Story Arcs Continue: BBC editor Justin Richards revealed to DWM that "a shocking new series of twists and turns" is part of the current commission series of Eighth Doctor books for the latter half of 2001, leading up to the BBC's 100th DW novel released in January 2002. Cover Redesign? : Could a redesign of the BBC books' covers be in the cards in the near future? There are currently rumors at BBC Books that BBC Worldwide wants to revamp the covers to bring them more in line with the DVD covers (which, by reactions elsewhere on the web, are almost universally hated). More information as we get it. The Five Missing Books: As many dedicated Doctor Who readers in North America know by now, five Doctor Who novels from BBC Books have gone astray on the US release schedule: "The Ancestor Cell," "The Burning," "Heart of TARDIS," "The Banquo Legacy" and"Prime Time". After repeated checking, we have discovered that the release date listed by London Bridge is now April 2001, though a recent update from London Bridge to the owner of Ambrosia Books, Ken Barr, indicates that (a) this hold-up may be rectified a bit sooner and the books released earlier than April (perhaps even as early as January 2001), and (b) that three of the five books may indeed begin shipping out within a matter of weeks. (We have not confirmed which three.) All five books were earlier released to specialty bookstores and some chain outlets (including some Borders and Barnes & Noble booksellers) that had specifically ordered them; however, after these initial releases, the distributor closed release of these books, and therefore, retailers are unable to reorder them (or chain bookstores and online bookstores such as amazon.com, order them in the first place). Overseas retailers (and overseas online shops such as amazon.co.uk) are unaffected, and it appears Canadian booksellers can still get them. Retailers who have copies (such as Ambrosia which does have copies of three of the books left) have them from their initial orders. The BBC has been made aware of the April 2001 release date but at the moment is unable to get that date changed; the books are now unavailable to any and all retailers until that time. We will keep you posted when we receive further information on the release of these books. Meanwhile, author Dave Stone has taken the ball, so to speak. "Free the Fatal Five" T-shirts and other merchandise are now available via the CafePress website, with a logo created by Stone (the author of one of the five books in question, "Heart of TARDIS"). Introducing Anji Kapoor: BBC Books editor Justin Richards has given fans a taste of new companion Anji Kapoor, who makes her official debut in the February 2001 Eighth Doctor novel "Escape Velocity" by author Colin Brake. Anji is a trainee stockbroker in the London's City financial district and will join the Eighth Doctor for further adventures in space and time. "Anyone suddenly throw off into space is going to be out of their depth," says Richards. "The new companion, Anji, who we've got coming in, is someone very professional, very good at the job she does - she's 27, 28 and something in the City and absolutely the tops at what she does - and yet suddenly she's in a situation where none of these skills matter, and it's all completely over here head. She's out of her depth not through any fault or lack of intelligence of her own - it's something she's completely untrained in, and environment she's no idea how to influence. Very much how we'd really be if that happened to us - if you woke up one morning and found yourself on an alien planet, God knows what you'd do. You wouldn't have a clue. I'd probably go to pieces. ... The brief I gave Colin Brake -- who's writing Anji's introductory story 'Escape Velocity' -- was pretty much what I've just told you. She's got skills that aren't directly related to what she'd going to be doing - if she was in the SAS or something, it'd be obvious how that would relate to the sort of adventures she'd going to be having. But if she's got a head for numbers, or can predict how economies are going to rise and fall, then that's more interesting to play with in a different sort of way. So that's what I gave Colin. He came up with the background for her -- an Asian Englishwoman -- and also a wacky brother, who's into UFOs and stuff, which she really has no time for at all. ... Since we announced she'd be coming in, a couple of people have asked if she'd based on Milly in 'This Life'. I've never watched 'This Life' - well not more than 10 minutes at a time. I asked Colin and he said 'I've never seen it. I haven't got a clue!'. However you build them, companions have to be an archetype to some degree - so it wouldn't be a surprise if there was some contemporary resonance..."
The Monthly Telepress: Jac Rayner of BBC Books has created The Monthly Telepress, a new email newsletter designed to keep readers updated with developments in the world of Doctor Who fiction. To subscribe, send a blank email to telepress-subscribe@onelist.com. Steve Emmerson ("Casualties of War") is on the list of authors likely commissioned for books in late 2001. Peter Darvill-Evans pens his second BBC book in May 2001, entitled Asylum, a Fourth Doctor novel set in 13th Century Oxford. The book is a 'Name of the Rose' style mystery with a science fiction twist, and features the Fourth Doctor and Nyssa - albeit the post-'Terminus' Nyssa, who re-encounters the Doctor before he first meets her younger self in 'The Keeper of Traken'. It is believed to take place in the "Deadly Assassin"-"Hand of Fear" gap. The demise of Lawrence Miles ("Interference") in the BBC Books line may have been premature... as it now appears Miles is currently pitching a new novel for 2001. 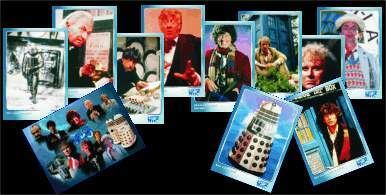 The November 2001 Past Doctor book will feature the Second Doctor. Author David McIntee will indeed return in August 2001 with Bullet Time, a Seventh Doctor story, "a quasi-contemporary thriller set in Hong Kong and the Far East in which the Seventh Doctor, travelling alone prior to the TV Movie, shares the limelight with investigative journalist Sarah Jane Smith." (Actually, says McIntee, the book is more a Sarah novel with the Doctor rather than the reverse). Martin Day pens the February 2001 Past Doctor adventure Bunker Soldiers. It's a First Doctor, Steven & Dodo pseudo-historical adventure. Day has confirmed that the book has been moved to the February slot, replacing "Psience Fiction" which was delayed until later in the year. Kate Orman returns to the Doctor Who fold with June 2001's The Year of Intelligent Tigers, an Eighth Doctor book set on an Earth colony and featuring, as the title suggests, talking alien tigers. Meanwhile, Trevor Baxendale, as previously reported, pens Eater of Wasps, an Eighth Doctor book due for release in May 2001 and set in a quiet English village with mayhem, murder and wasps. Former BBC Books editor Stephen Cole returns in April 2001 with Vanishing Point, an Eighth Doctor book with Fitz and Anji. According to Doctor Who Magazine, one of the Past Doctor books in the first half of 2001 (probably June) will feature the Daleks. The title and author are as yet unknown. BBC assistant editor Jacqueline Rayner recently confirmed that there would be no fourth "Short Trips" volume for 2001 from BBC Books. Novelist Nick Walters will write his third Doctor Who novel for BBC Books, Superior Beings (formerly "The Gardens of Rocosia"), a Fifth Doctor & Peri novel set for release in June 2001. The book "introduces a new race of aliens, the vulpine Valethske, and is set on the "garden planet" of Verde Alturas" according to Walters, who told Outpost Gallifrey: "The novel features some human characters - the story has changed a great deal from the initial synopsis. The main stars are, however, the Valethske - a race of vulpine, bipedal aliens on a quest to track down an ancient enemy of legend." Editorial assistant Jacqueline Rayner's first Who novel is on the schedule: EarthWorld, an Eighth Doctor book with Fitz and Anji, scheduled for March 2001. "Earthworld" marks a return to adventures in time and space, following the earthbound arc of stories ending with Escape Velocity. It is set on an alien planet which is the site of a huge theme park celebrating Earth history, staffed and peopled by androids. In addition to lots of 'evil teenage girls', it also features a cameo appearance by a monstrous adversary of the Doctor in the 1960s. "Rags" is a new Third Doctor/Jo Grant/UNIT novel by Mick Lewis, the author of the horror novel "The Bloody Man"; this is his first Doctor Who commission. "Rags" will be released in March 2001 (moved from April). Gary Russell returns in April 2001 (moved from May) for "Instruments of Darkness", the 'third and final' part of the loose 'trilogy' of his books from the Sixth Doctor era (including "The Scales of Injustice" and "Business Unusual"), featuring Melanie and a special guest appearance by Evelyn Smythe, the new companion character created for the Big Finish Doctor Who audio line. Craig Hinton pens his first BBC Doctor Who novel, "The Quantum Archangel" in early 2001. The book is a sequel to the TV episode "The Time Monster" and features the Master and the Chronovores and is set for release in January 2001. Colin Brake's novel "Escape Velocity," slated for February 2001, introduces new companion Anji Kapoor and features an invasion of Earth. Lance Parkin returns to the Doctor Who fold with "Father Time", the January 2001 Eighth Doctor novel. "Earth in the nineteen-eighties is a battleground. Rival alien factions have travelled from the far future to pursue their vendetta. As UFOs fill the skies, a giant robot stalks the Derbyshire hills, and alien hunters search for the mysterious Last One, the Doctor is the only man who can protect the innocents caught in the crossfire. But old scores are being settled, the fate of a Galactic Empire is at stake, and, against his will, the Doctor is drawn into a decade-long war that will strike at those he holds most dear. The Doctor has lost his memory, his friends, his past and his TARDIS. All he has now is the love of his daughter. But will even that be taken from him?" Milwaukee Who Exhibit: A Doctor Who exhibit is being sponsored by the Milwaukee School of Engineering. The display entitled "TIME AND SPACE ON TELEVISION: An Exhibit of Realia from the Longest Running Science Fiction Show in the World" will feature items and printed works related to the series, and "is designed to educate students and visitors to the importance of popular culture studies and also to educate and entertain those interested in science fiction" according to the press release. "Items such as books, annuals, cards, action figures, comic books, toys, and autographs will be featured. The display will also feature costumes that were worn on-screen in the Doctor Who episodes 'The Caves of Androzani' and 'The Trial of a Time Lord.'" The exhibition runs November 23 2000 to February 1 2001 at the Walter Schroeder Library of the Milwaukee School of Engineering in Milwaukee, Wisconsin. For more information about the exhibition, emailseidler@msoe.edu or visit http://www.msoe.edu/library/. Washington Post on Who: The Washington Post newspaper ran a special article on Doctor Who on Saturday, December 2 in conjunction with Maryland Public Television's broadcast of the program. To view the article, visit http://www.washingtonpost.com/wp-dyn/articles/A13183-2000Dec1.html. Dark Dimension Screenplay Auction: A script for the abandoned Doctor Who project "The Dark Dimension" was found stuffed in the drawers of a piece of furniture formerly belonging to a BBC executive, is up for sale at an auction in Swindon, noted as "part of an archive of papers relating to unquestionably the most famous science fiction (TV) programme of all time," and estimated to fetch between 1500-2000 pounds at the sale. "The Dark Dimension" was the aborted 1993 special that would have featured Jon Pertwee, Colin Baker, Tom Baker, Peter Davison and Sylvester McCoy, written by Adrian Rigelsford; it was abandoned due to contractual difficulties and behind-the-scenes concerns. The collection of papers also includes an intriguing memo noted "Dr Who - Long Term Strategy" and includes the item "Under no circumstances should this document be left lying around. Whovians are everywhere and this is a very senstive document. I would not like to see it reproduced in any Dr Who magazines!" Morris Barry, former BBC director whose works include directing three Patrick Troughton Doctor Who tales ("The Moonbase," "The Dominators" and the classic "Tomb of the Cybermen"), passed away in November at age 82. Jonathan Barry, the director's son, contacted Outpost Gallifrey to inform us of the death of Mr. Barry, whose work on "Dr. Whoof" (as he called it) was important in the early years of the program. Barry taped the introduction to "Tomb," which had been discovered in 1992, for the video release of the serial. Lawrence Davidson, who played the Draconian First Secretary in Frontier in Space, died in October. He also appeared in episodes of The Saint and Danger Man.